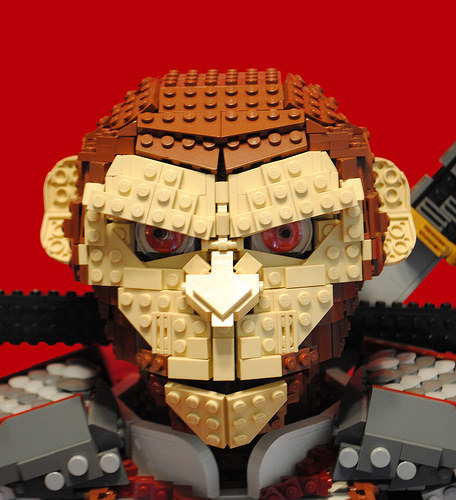 Tyler Halliwell is best known to our regular readers as a creator of amazing LEGO busts. So his latest work – depicting the Monkey King of Chinese mythology – is an ambitious departure in terms of its size and construction. We think you’ll agree that the attention to detail and the naturalness of this figure’s clothing and facial expression are completely mind-blowing! BB: So how many hours and how many bricks went into this creation? TH: That’s tough to estimate, but probably about 100 hours over the past two months, with most of it coming into shape in the past two weeks. There’s less pieces than you’d think, as it’s mostly hollow but for a technic frame. So if I had to guess, I would say around 1500 bricks. 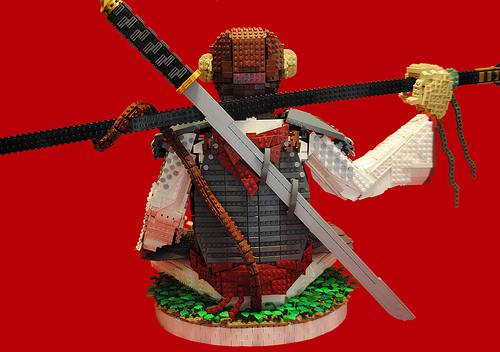 BB: What inspired you to choose the Monkey King as the subject of your latest LEGO sculpture? TH: A friend wanted to commission me to make a statue of Goku from Dragonball Z, and I found out that character was based on the Monkey King. In high school we watched a Chinese opera about the Monkey King and I always thought he had a cool back story. 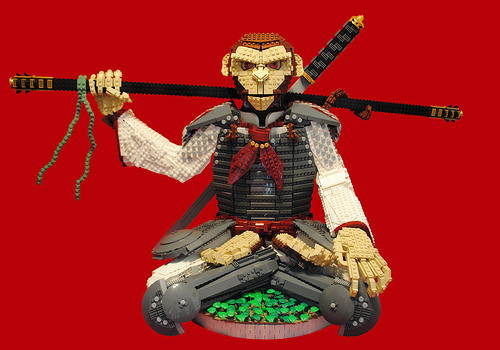 So as I was looking for an immediate build after the rush of Brickworld Chicago, the Monkey King it was! BB: What made you go for a full body sculpture this time, and of this particular size? We imagine it must have been quite challenging to complete! TH: Every time I’ve made a bust, I’ve had the nagging idea to make a full figure at that scale. I went into this build with that plan, but wasn’t going to follow through once the head became as large as it is! The head itself is one of my larger bust heads, more so than Dream or the Faun. This was a bit of a challenge, given the weight I was looking at, so in order to do the full figure, I had to compromise and make him sitting, which I think actually turned out to be a better choice artistically as well. This is quite a large build, at 40″x15″x21″ overall. I knew I’d be driving it to conventions in the future, so for easier transportation the arms detach, the torso is just pinned to the base, and the back armor piece snaps off and on to allow access to the inside. The logistics of all of this were hard to deal with, while still keeping the creation fairly seamless. Also, as usual, I build very chaotically and with many odd angles, and so the overall structure is a mess, especially inside the head and the lotus positioned legs. This, I think, is the pictorial definition of amazing.